The Catholicon, written by the Dominican Johannes Balbus (d. 1298) of Genoa, is a long treatise for the study of Latin, divided into five parts: orthography, prosody, grammar, rhetoric, and etymology. This copy was owned by the Augustinian priory at Stone in Staffordshire (half-way between Stoke-on-Trent and Stafford). 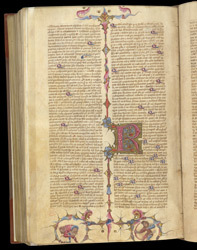 The initial 'R' at the start of the section dealing with words beginning with R, is accompanied by border decoration showing an archer about to shoot an arrow at the exposed backside of another man. The style, especially of the figures, is very un-English, suggesting that the artist trained in Italy, or was trying to copy an Italian exemplar.